This is one of the renderings that was shown at the public meeting at The Palace. It does not represent a final design. It's more of this-is-what-could-be-possible sort of image. 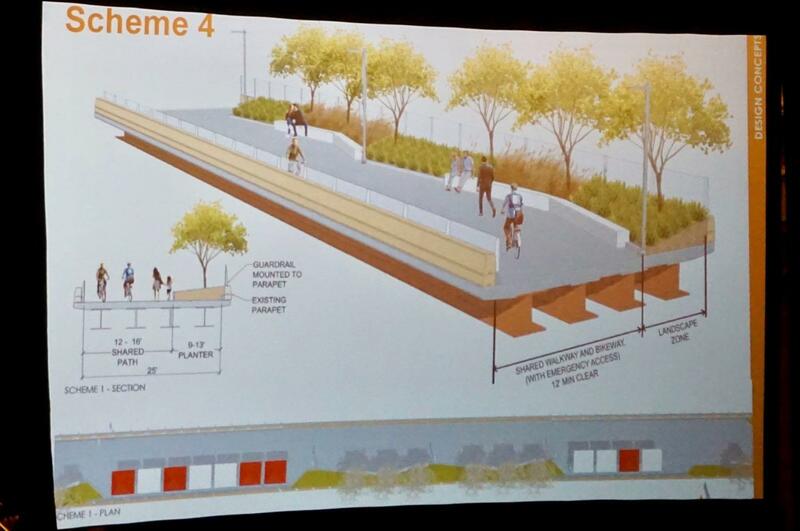 Here are the four layout concept options the Stantec team presented for discussion. 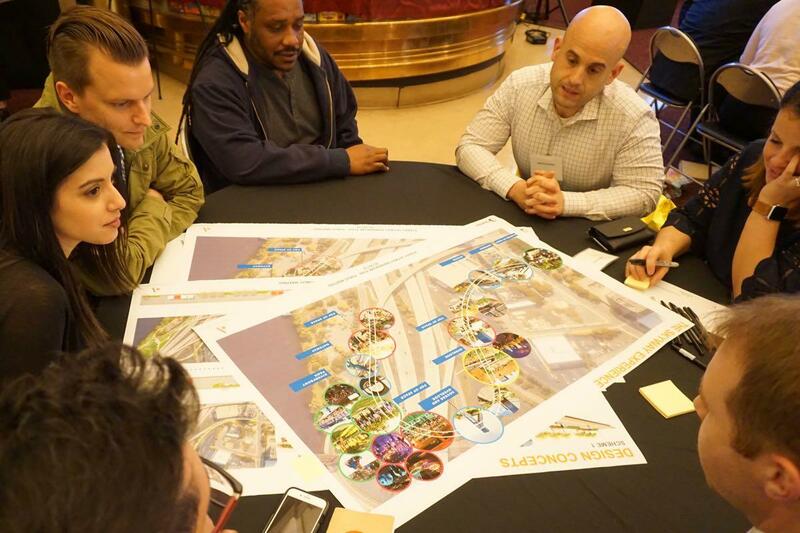 The Albany Skyway project is continuing to move forward, and this week the engineering team heading up the design work presented a few potential concepts for how to use the space on the new linear park/riverfront connector in downtown Albany. The green marks the ramp that would be repurposed. 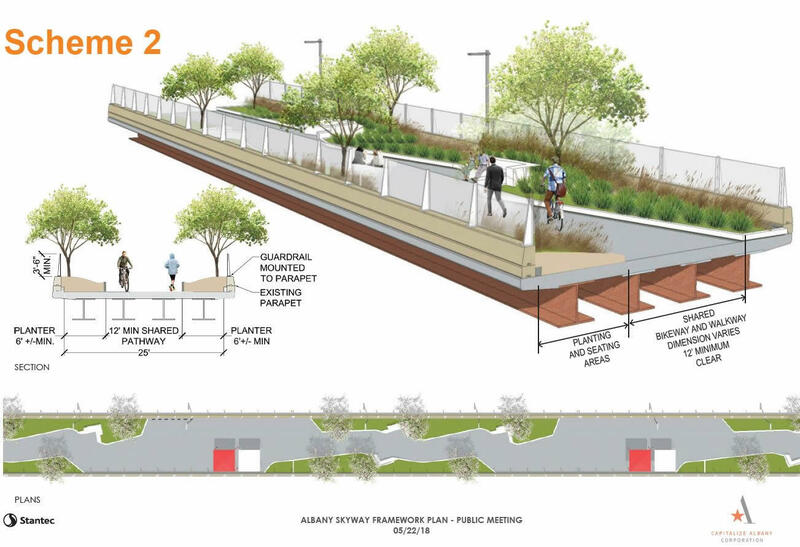 A quick recap of what's going on: The Albany Skyway is a project to convert a relatively lightly-used off-ramp from I-787 to Clinton Ave in Albany into a pedestrian-bike connector/linear park between Broadway and the riverfront. The project got a big boost earlier this year when the Cuomo admin committed $3.1 million to it. 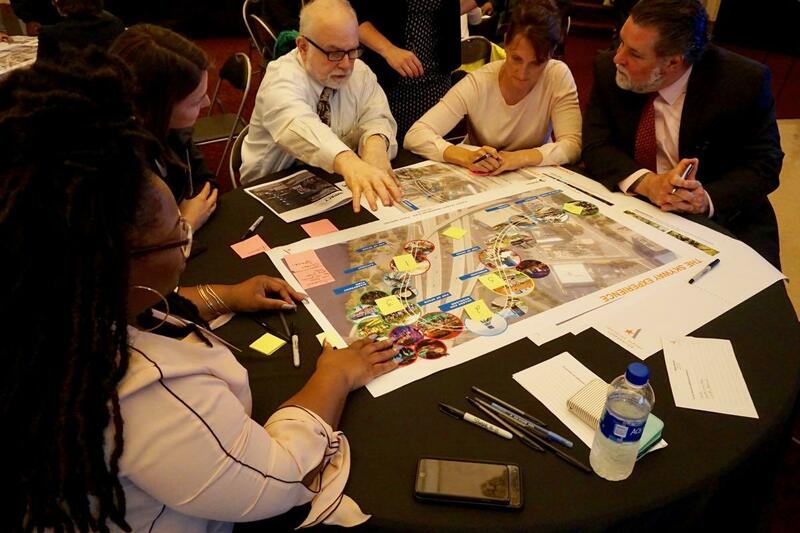 Back in March there was a packed public meeting at which officials and the design firm Stantec outlined the project and gathered some initial input about what people would like to see happen on the almost-half-mile long ramp. This month the project team walked the ramp and surveyed views from it. 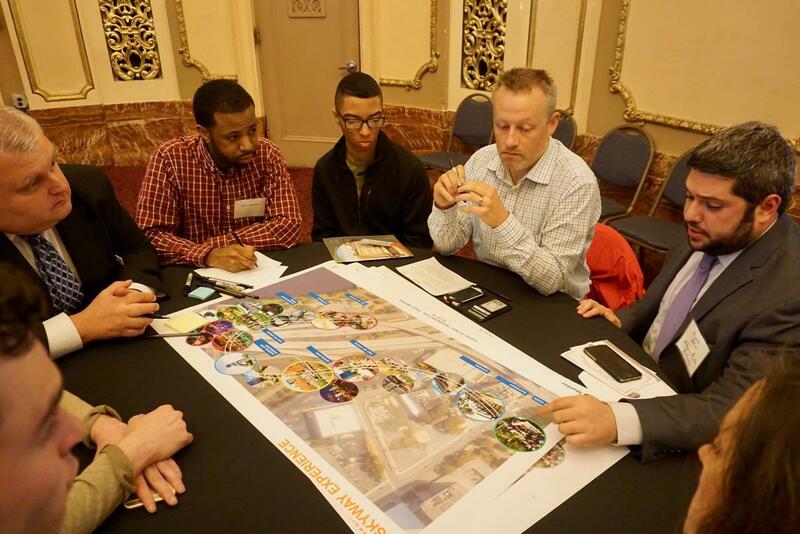 This past Tuesday evening at The Palace, city officials and reps from Stantec presented a handful of concepts for the project at a public meeting at The Palace. 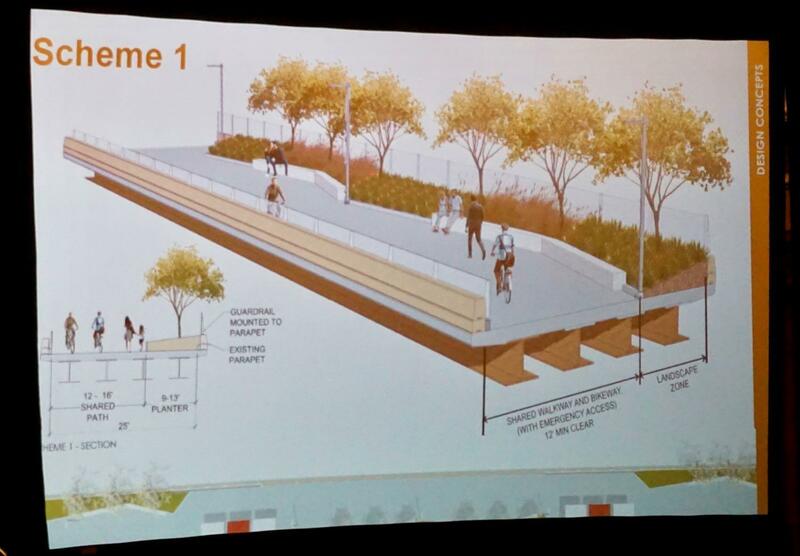 Stantec is referring to the concept designs as "schemes." Basically they're a way of working through how the space on the ramp could be organized and used. All of them incorporate walking/cycling space, greenery, and places for gatherings or programs or events. It's just a matter of how those elements are arranged -- maybe people want a lot of event/gathering space grouped together into a few larger areas, or maybe they'd prefer a few different spots scattered along the stretch. You'll no doubt want to study the layouts a little bit, so they're at the top in large format -- click or scroll all the way up. It is important to note that these are concepts and not a final design. And Stantec reps stressed the concepts can be mixed. For example: The middle section of the ramp could have a different configuration from the ends. 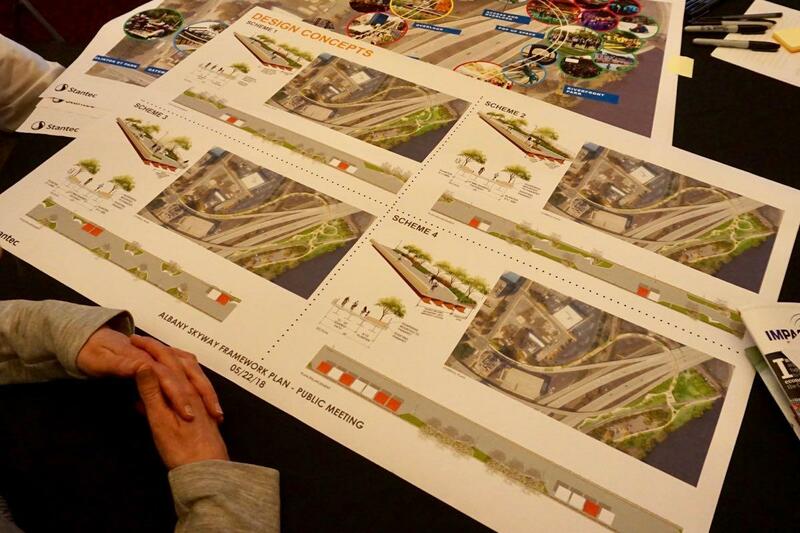 There's another important part of the concept designs that doesn't necessarily come through all that well in the presentation shown at the meeting, and that's the planned use of a wedge of grass between the river end of the ramp and the Livingston Ave Bridge (see the embedded map above). As the design team explained, this piece of land doesn't get much use now and the skyway is an opportunity to reclaim it. And as the presentation graphic just above notes, these use concepts would include different potentials for funding. 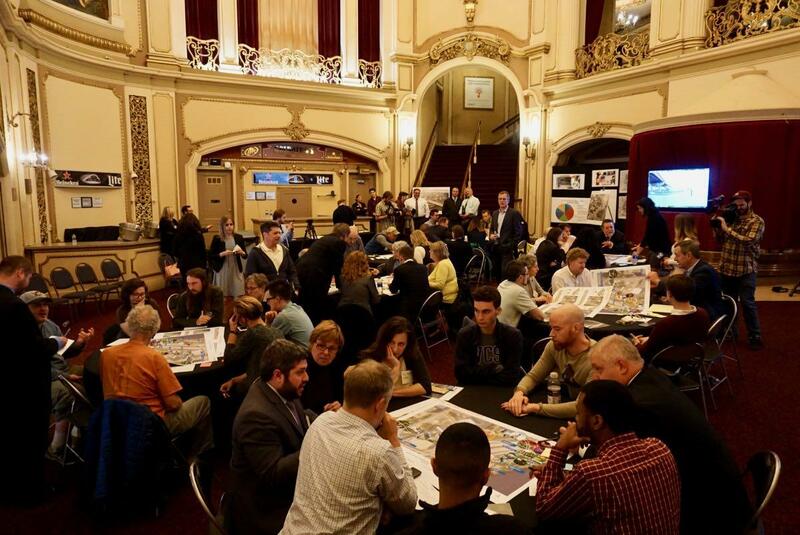 The event at the Palace followed the typical public planning session format: presentation for the crowd, then everyone breaks out into table discussions to share ideas, and then each table presents what they talked about at the end. Of the concept designs, about half the tables indicated they'd like to see some combination of schemes two and four. A connector or place to be or both? 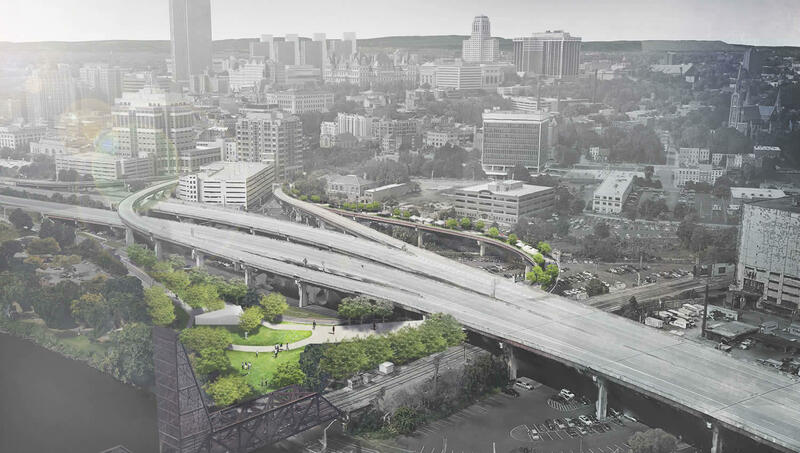 We mentioned this issue after the March meeting and it still feels like the key design question: Do people want the skyway to be a place to hang out and spend time or do just want it to essentially be a bridge to the riverfront. Of course, it doesn't necessarily have to be one or other only, but the purpose will shape the design. Toward that end: Not everything that people want is going to end up in this project because of cost. Officials figure that $3.1 million is enough to get the skyway open, but any project of this type is going to eat through that money quickly. And there are some elements that must be included. For example: The Stantec reps talked about the requirements for installing railings and fencing of various heights along the span to comply with safety regulations. Maybe there's a way to design that fencing so that it's attractive and creates a sense of place (but, you know, that also probably won't be the cheapest option). On the other hand, the skyway has to meet some minimum level at usefulness and attractiveness so that people want to use it and feel good about it. So the choice of priorities for design and amenities is important. The Stantec team pointed out an important bit about similar projects around the country: They tend to be built with public money, but they end up be largely maintained and operated via private money. 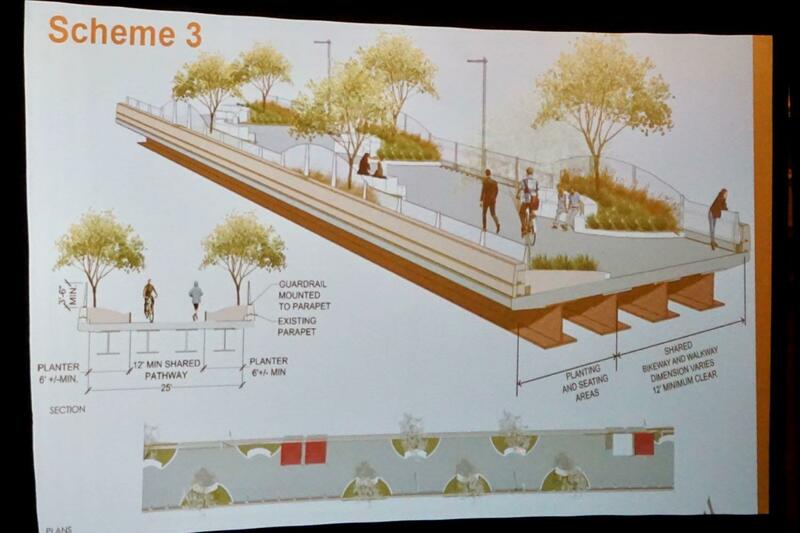 So the design of the financial supports for this elevated park are a key issue. And this question loops back to other questions about how the skyway will be used. The more intensive the uses and programming, the more funding will be required. Even so, there will be some baseline cost for maintaining this project. That means some group, some entity, some people will have to be in charge of overseeing things and gathering up funding. Maybe that's a governmental entity, maybe it's a Friends of the Albany Skyway non-profit. But there should be some reasonable answer to this question before the project advances. The Albany Skyway has to be a committed project by 2019 for the city to hang on to the state funding, so officials are pushing things forward at a relatively rapid pace. The Stantec team is working up specific designs for the project and, importantly, how much exactly those designs might cost. The draft designs and cost estimates should be a major part of the next public meeting, which is tentatively slated for sometime in the next 4-5 weeks. Keep an eye out for it. 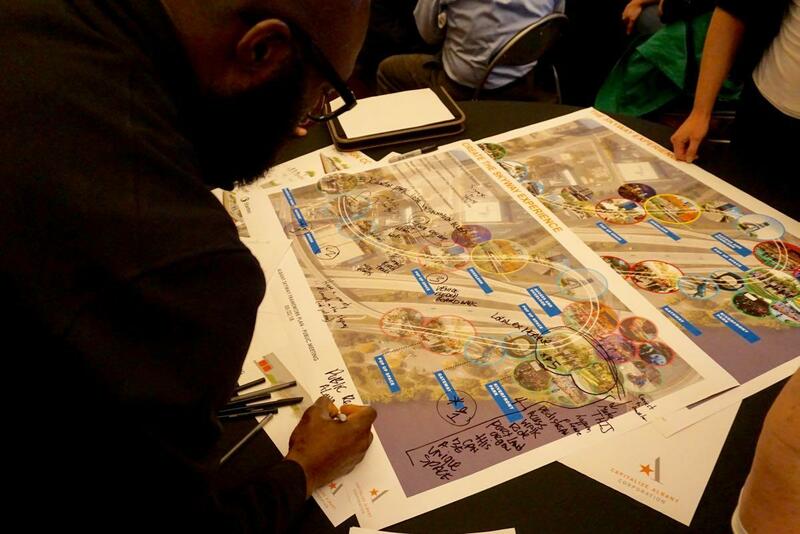 Capitalize Albany is coordinating the design and planning work for the Albany Skyway. It also administers the Amplify Albany grant program that provided funding to offset costs for the AOA public event with presidential historian Alexis Coe in downtown Albany. Although I think the city is best served by having the state decommission and demolish this section of highway, if it is to be, then a couple things to consider. 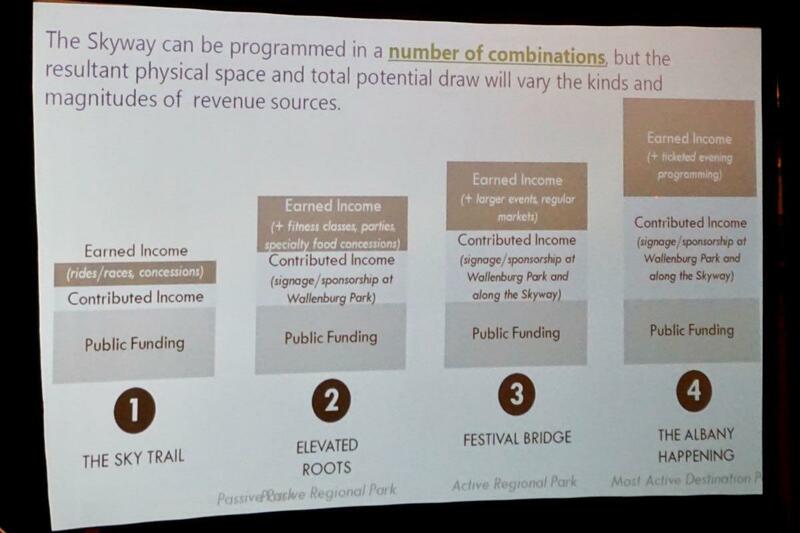 First, a big challenge is integrating the trail with Broadway along the exit ramp that feeds B'way from 787.The second is covering the cost of maintenance, not only of the linear park, but of the framework holding it aloft. Still, even with those items, the overall project may end up being cost effective over time since Albany gets to cross the railroad tracks without having to involve the railroad. The railroad is the overlooked problem in getting to the waterfront, not just 787. They should definitely do anything and everything to be more than a riverfront connection, because that's a long walk just to get over 787 & the railroad. Maybe they could add stairs on each side for those just looking for a crossing? this was designed to be a road. Festivals, races, farmers markets? we already have these in areas not TOUCHING 787. what about the 6 months of the year when this will be deserted? There already is access to the trail/waterfront that goes under the railroad 1 block away. You can see it in the picture. That is where people park now to access the area. improving that access makes much more sense. get rid of it and put a baseball park or outdoor hockey rink in the area where the wedge is now. Ron, that's not the railroad people are talking about that blocks access to the riverfront. There are two tracks situated between the north and southbound lanes of 787 -- you can take a walk over the pedestrian bridge to Jennings Landing to check them out. Any surface level access has to deal with those. Yes, people drive and park to access the preserve now. If you live on Broadway or Clinton Ave or Pearl St. or etc. etc. it doesn't make sense to drive (a circuitous route) to the river you can see from your bedroom window. Still agnostic on this project but it doesn't provide much more convenient access than the pedestrian bridge. I agree with some of the other comments here. We already have a pedestrian bridge crossing 787 and the railroad to get down to Jennings Landing. This doesn't really add that much value and comes at a huge expense. 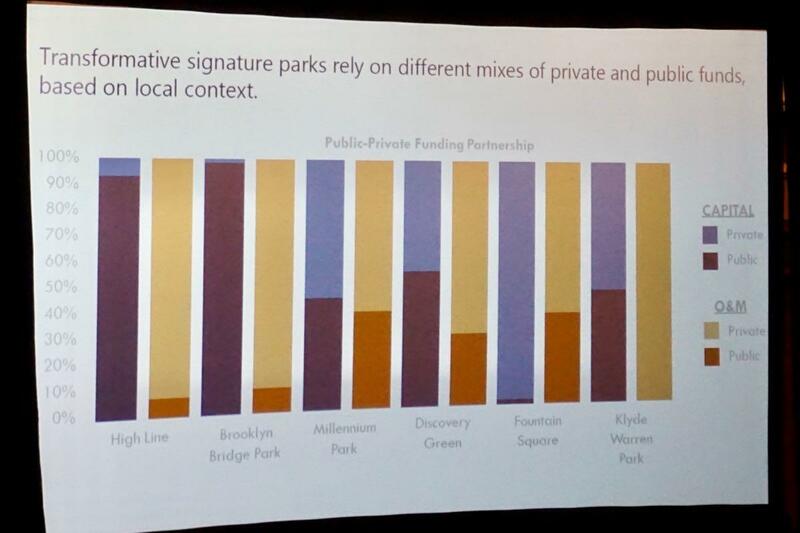 Once you factor in the future maintenance costs of not only some type of park, but also a bridge (one that is already relatively old), this idea doesn't seem like a very good one. Strolling leisurely on a highway ramp? What about the noise from the highway? How are you going to suppress that? Albany could have a very attractive riverfront, with shops, restaurants, etc. if the section of 787 that borders the river could be either buried in a tunnel or simply decommissioned and removed. As we all know, putting highway 787 between the city and the river was the worst planning mistake ever done in Albany. It killed any hope of developing a lively downtown and riverfront. Any talk of tearing down 787 is wasted words - a project that size, let alone funding, is years away. Maybe people born during the 2020's might see it in their lifetime, as well as a waterfront really worth having access to. Remember, this is nothing like NYC's High Line Park. That said, having climbable trees along the guardrails is a security & safety issue. If they're installed, they should be dead center of the skyway and nowhere near the elevated highway. I support this project since it represents traction and establishes an ideal route to access a future bike/ped accommodation across Livingston Ave bridge. If you think of it that way, it makes more sense. On its own, yes, the skyway is a circuitous route to the waterfront. @Jean-Francois Briere: The design team touched on the noise issue during the presentation. (I didn't include it above because of length, though I probably should have.) In short, the team took noise readings at various points along the ramp and the highest level was 80 decibels just above the train tracks when a train was passing through and 70-80 decibels in two spots with higher levels of adjacent traffic. Here's a table of relative noise levels. Their take was that the noise level wasn't going to be a big issue. I need to do more reading on this topic, but I do wonder about the upper end of that noise range and how possible it would be dampen some of that noise. @Jack S. The possible connection to a new Livingston Ave Bridge (whenever that happens) is really interesting. It's not hard to imagine a continuous series of pedestrian/bike pathways from Broadway in Albany all the way across the river to Rensselaer. He quickly draws a large pin from a holster at his waist and just as he's about to pop the proverbial balloon of skyway park dreams, he declares, "I bet you that 3 million dollars could fill a lot of potholes." If and when it is built, it would be great if it could be named in honor and memory of Dr. Warren Roberts, the late Professor Emeritus at University at Albany. He was a walker and cycler and loved Albany and its architecture. I would even donate towards this skyway! Can we stop trying to copy the NYC Highline? There are simpler ways that this can be done. The Highline works because it isn't connected to other roads (or rails), and it is LEVEL. I really have no skin in this game, but the whole idea as far as I am concerned is absurd. Surely hiring engineers who excel in inner city functionality would be an asset. Why does no one mention the current/future development that would use this ramp if it continued as is. Right were it lets out is Quackenbush Square, 181 units, a 136-room hotel, and about 24,548 square feet of ground-level retail space now under construction. A quarter mile further north on Broadway, 790 Broadway, 88 units (72 studio and 1BR / 16 2BR) now under construction. And there are a lot of empty lots still there. This is madness. Maintain a ramp for 40 years of light use and then decommission right before the need for it explodes? Bizarre. I continue to believe this is an idiotic idea. There are lots of things we could use $3 million on. We have a massive amount of distressed housing that could be rehabbed. This is an idiotic waste. What about the 2,000 cars now using the ramp each day? They will have to use another exit and then weave their way back through local streets. This more circuitous travel will add congestion, fuel consumption, and pollution to downtown. Has anyone looked into and evaluated this side effect? The bike people see inconveniencing automobiles as a plus. This entire project is pointless. I recognize I've become "that guy" advocating again and again to mostly the same group, but you know what they say about squeaky wheels. Detractors should consider what's just look beyond the footprint of the Skyway. The emerging Empire State Trail, waterfront development, and a bustling residential portfolio of both sides of the river are creating an enormous demand for access along the waterfront and a complete, safe trails system that not only connects us to the river, but parts north, west, and east. But how can we get east? Right now, the only options are 378, which is great but rather remote unless traveling between Albany and Troy, or the Dunn Memorial. The Dunn Memorial is an atrocious mess. It's steep, narrow, unpleasant, scary, and downright intimidating. It's also not capable of providing access for kids, strollers or the mobility impaired. The largest advantage of the Skyway is it's potential to provide a connection to the Livingston Avenue Bridge - an absolutely critical link in the growing state-wide trail network. Think about it. A 150-mile Hudson Valley Greenway Trail to the south. The 350-mile Erie Canalway Trail to the west. The 200-mile Champlain Canal trail to the North. All of these trails of national significance converge on Albany - and there's no safe, accessible and attractive way to close the gap between them. The Skyway would be Albany's gateway to the Livingston Ave. Bidge. It's less than 25 feet away - and at grade. Connecting to the Bridge when the bridge is replaced requires ensuring TODAY that the replacement bridge will have a walkway. The Skyway will happen. That's a fact. It's time to lock in the future potential of the Skyway as an asset of state-wide significance. It looks like this will be built so we should use this opportunity to make as many adjustments as we can along with it. Quay Street can be re-routed west just before it splits from the existing exit ramp so that it connects to Water street under the elevated portion of 787. When this is done the section of Quay St. that squeezes the bike trail into the river can be removed improving river access. Bob, I'm a little confused by your suggestion, but maybe I'm just not understanding you. Quay street already connects to Water Street at the boat launch parking. It also already connects to Broadway via the underpass immediately at the end of 787 Exit 4. Both are circuitous but manageable. If you suggest cutting across somewhere in the vicinity of Orange Street, sure 787 is elevated but you have two rail lines to cross. 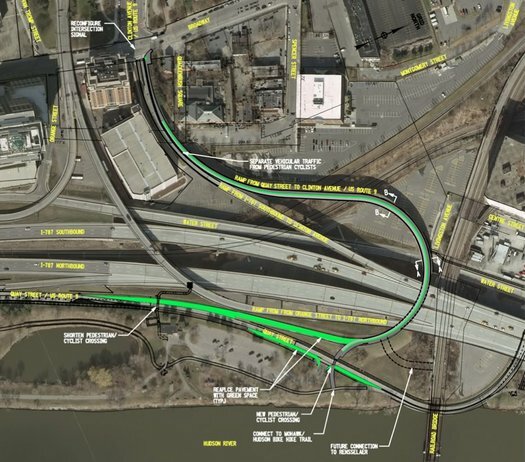 Most likely any other connection from Quay to Broadway would either have to also be elevated over those or go under them -- both pretty unlikely. I don't even know if going underground there is possible as most of the land that 787 rests on in that area was filled in -- where Quay is now was the original riverfront shoreline. You could potentially connect the gap in Colonie street (along the side of the Central Warehouse) but there's also an active rail line in the way there -- though the same one that Ferry crosses with no problem. I think you're saying eliminate the section of Quay that runs under the Livingston bridge but this provides access to the boat launch parking and several OGS lots on River St (these are the primary parking for the 13-story DEC building at 625 Broadway). It's an interesting suggestion though. I bring this up (again) just to highlight what a disaster the current access to Albany's riverfront is, and how many obstacles are in the way to anything resembling a decent non-motorized connection between it and the city. I appreciate the criticisms of the greenway project but unfortunately it's as good as we will probably ever get until funding for maintenance on 787 is cut. -B, I was suggesting Quay St. north taking a left turn at the parking lot for the barge parking lot. It will access the parking lots under the elevated highway south of the railroad tracks and connect to Water street which can be designated two directions a short distance to Colonie street. This will give access to the parking lot north of the railroad tracks while removing at least one annoying road. This will give better access to the river at the end of the Skyway without having to cross another road. I am confused. Don't they have a pedestrian bridge that was a big deal?